Over the years I have sharpened my gouges on a fairly large variety of grinders. The first ones were cheap 6" ones with rather flimsy tool rests. The hard grey wheels were all that were available, and you were luck if they didn't vibrate a good bit. When the variable speed came out I tried one out so I could experience slow speeds, and for the first time I went to 8" wheels. They take longer to come up to speed, and of course the surface speed is effectively faster at the same RPM. The Sears variable speed grinder did an acceptable job. I found I still preferred a fairly high speed. I had switched to the white wheels, and then the red ones, for cooler cutting. Then came the Oneway wheel balancer. Boy did that help smooth out the ride. Well worth it I say. I started out with the old grey wheels, so famous for ruining the temper on regular steel, (not to mention your own temper). I switched to white aluminum oxide wheels when they came out, and then the SG grey wheels, and finally the Norton 3X, which I really like. I have tried 60 grit to 120 grit, and prefer the 80 grit overall. Just balance and true it up good, and dress it regularly, and take a light cut. Don't push it. And now I've moved to CBN wheel, cubic boron nitride. Imagine not having to keep dressing the wheel for a good clean cut or continually re-balancing it. They are sweet indeed, plenty pricey, but well worth it if you are using them ALL the time. I first ordered one from D-way Tools, the 80 grit. It cuts cool for sure, but leaves noticeable grit grooves on the surface. I now use 120 grit mostly. The trick is to use a light touch and let the abrasive do the cutting. Pressing in to hurry it up will slightly glaze the surface and end up reducing the cutting speed. Here is the grinder on the plywood shelf screwed to the wall. A sheetrock screw in through each hole in the base keeps it in place. You might notice I am running it about 3/4 speed. CBN wheel on the left, Norton 3X with Oneway balancer on the right, both 80 grit. The side cover plates have to be removed to install or change out a wheel, and since they mostly serve to trap shavings in my location, I have been removing them from my grinders. Also, the CBN wheel is so wide it simply won't in under most cover plates. On the Porter Cable it is not so simple, as the plate serves to hold the head of the bolt which holds the tool rest support. So I had to saw the center out on my trusty Harbor Freight metal bandsaw, and use just the outer rim of that cover plate. 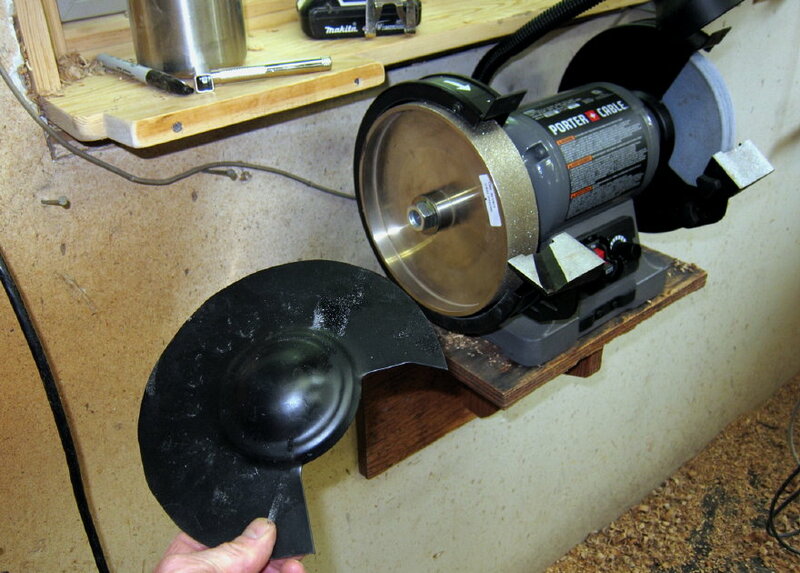 Here is the part I cut out in the foreground with the rim screwed onto the grinder. 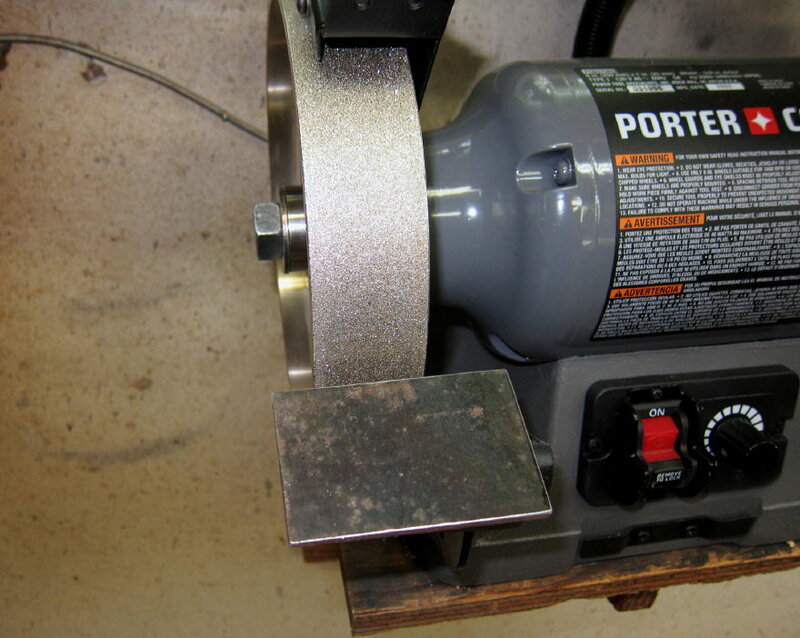 The Porter Cable comes with a slot in the left tool rest for sharpening drill bits. Worse than useless. So I cut out a 3" x 2" metal plate to cover it up. I beveled the back side of the top of the plate so it can nestle up close to the wheel. I should have used JB Weld or other epoxy, but so far medium density CA is holding the plate on fine. 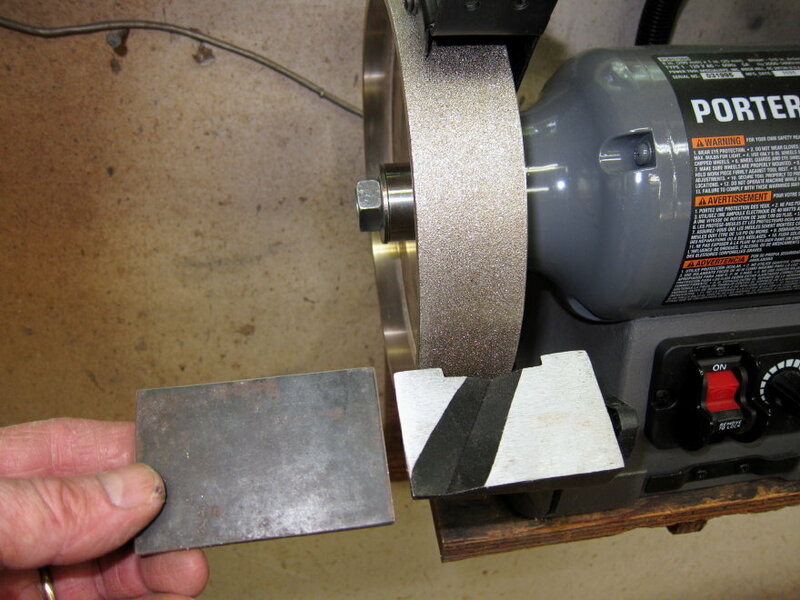 These simple flat plate tool rests do improve the usefulness of the grinder. Although the tool rest support itself is rather flexible, being made of a soft aluminum, it is stiff enough if you use a light touch in your sharpening. If you are using a Wolverine system this modification isn't necessary.